The modular LYSAGHT NEETASCREENÂ® is one of the most versatile and durable fencing systems you can buy. The COLORBONDÂ® pre-painted steel finish with vertical ribbed TRIMWALLÂ® panels provide strength and simple assembly. Gate kits also available to match. The modular LYSAGHT NEETASCREEN PLUSÂ® is one of the most versatile and durable fencing systems you can buy. The COLORBONDÂ® steel finish with vertical ribbed TRIMWALLÂ® panels provides strength and simple assembly. The fence is complemented by an attractive steel lattice and ball post caps to create a dramatic finish. LYSAGHT SMARTASCREENÂ® is the latest addition to the LYSAGHTÂ® range. SMARTASCREENÂ® keeps neighbours happy with its stylish appearance on both sides. The innovative panel fencing made of COLORBONDÂ® steel offers clean attractive lines with a unique subtle textured finish. LYSAGHT SMARTASCREEN PLUSÂ® is the latest addition to the LYSAGHTÂ® range. SMARTASCREEN PLUSÂ® keeps neighbours happy with its stylish appearance on both sides. The innovative panel fencing made of COLORBONDÂ® steel offers clean lines with a unique subtle textured finish. The fence is complemented by an attractive steel lattice panel and ball post caps to create a dramatic finish. The modular LYSAGHT MINISCREENÂ® is one of the most versatile, durable and attractive fencing systems you can buy. It has a durable COLORBONDÂ® steel finish with infill sheets in the classic LYSAGHT MINI ORBÂ® profile. 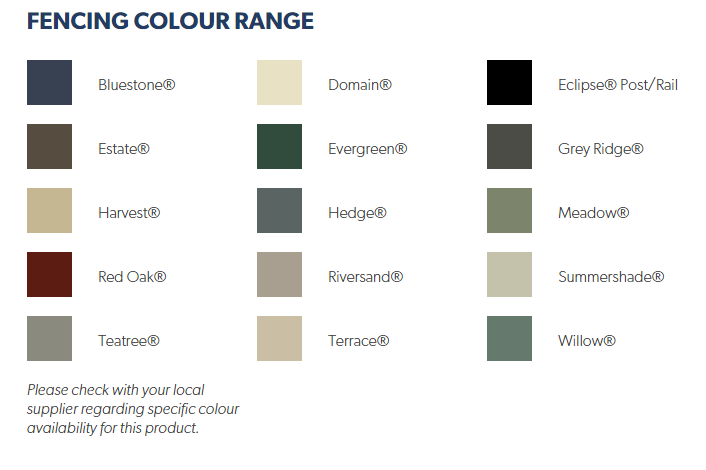 Gate kits are also available to match in COLORBONDÂ® steel colour range. The modular LYSAGHT MINISCREENÂ® PLUS is one of the most versatile, durable and attractive fencing systems you can buy. It has a durable COLORBONDÂ® steel finish with infill sheets in the classic LYSAGHT MINI ORBÂ® profile.